The Salimetrics Testosterone Enzyme Immunoassay Kit is a competitive immunoassay specifically designed and validated for the quantitative measurement of salivary Testosterone. It is not intended for diagnostic use. It is intended only for research use in humans and some animals. Salimetrics has not validated this kit for serum or plasma samples. 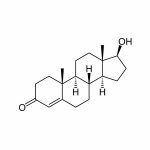 Testosterone is an anabolic steroid hormone synthesized from androstenedione in the Leydig cells of the testes of males and, in smaller quantities, in the ovaries of females. Small amounts are also secreted by the adrenal glands in both sexes. Testosterone production also occurs in peripheral tissues by conversion of circulating DHEA-S, DHEA, and androstenedione. Testosterone exhibits a diurnal rhythm, with highest levels in the morning and a nadir around midnight. In men, Testosterone plays an important role in the development of male reproductive tissues including the testes and prostate, as well as promoting secondary sexual characteristics such as increased muscle, bone mass, and hair growth. In blood, only 1-10% of Testosterone is in its unbound or biologically active form. The remaining Testosterone is bound to serum proteins. Unbound Testosterone enters saliva via intracellular mechanisms, and in saliva the majority of Testosterone is not protein-bound. Salivary Testosterone levels are unaffected by salivary flow rate. The serum-saliva correlation for Testosterone is very high for males, but only modest for females, possibly because women’s values often fall near the bottom of the measurable range for both serum and saliva immunoassay kits. 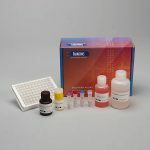 This is a competitive immunoassay kit. Testosterone in standards and samples compete with Testosterone conjugated to horseradish peroxidase for the antibody binding sites on a microtitre plate. After incubation, unbound components are washed away. Bound Testosterone Enzyme Conjugate is measured by the reaction of the horseradish peroxidase enzyme to the substrate tetramethylbenzidine (TMB). This reaction produces a blue color. A yellow color is formed after stopping the reaction with an acidic solution. The optical density is read on a standard plate reader at 450 nm. The amount of Testosterone Enzyme Conjugate detected is inversely proportional to the amount of Testosterone present in the sample.